Expect to see lots of grumpy faces in Russia. It’s not because the people are angry, it’s just because Russians prefer to get to know a person before they grant them a smile. Russians believe that smiles have to be sincere. Doesn’t matter how many plastic bags you already have at home, if you come from a grocery store with a new one – you’re keeping it. After all, you never know when you might need one. Anytime a Russian person goes to visit someone (even if it’s only for an hour), they bring something with – chocolate, candy, coffee, homemade pastry, a bottle of wine or even flowers. Once the bottle is empty, it’s gotta go on the floor. Russians are very superstitious, so they believe that an empty bottle on the table means empty table forever…basically you’ll have nothing to eat or drink in the future. No wonder that many people all over the world consider Russian ladies to be the most beautiful women in the world. Russians always dress up when they go outside, even if they’re just going to the store for 5 minutes. Another Russian superstition. Apparently, if you lick the food of the knife, you’ll become an angry person. The more you lick – the angrier you’ll become. Even all the little kids in Russia know that! If you’re getting a wallet or a purse as a gift for a Russian person, make sure you put some money inside of it. It doesn’t have to be a lot, just a few rubles will do. Supposedly, a purse or a wallet with no money in it will always be empty. It’s a Russian tradition to sit for a minute before you go on a trip. Why do they do it? For good luck! 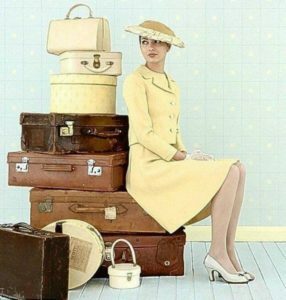 Once you’re all dressed, suitcases are packed and ready, you all have to sit down and stay like that in total silence at least for a minute. Whistling is usually an expression of good mood in many places; however, not in Russia, and not indoors. It’s definitely bad luck to whistle indoors, and considered impolite in Russia. You might lose all of your riches and possessions. If you spill salt in Russia you will end up arguing with somebody or being unhappy. Well, at least that’s what Russians believe in. 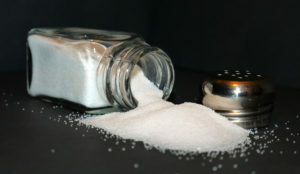 Another superstition with salt is – if the dish is too salty, whoever made it must have fallen in love. New Year is the main holiday. Nope, not Christmas, but New Year. It’s considered to be a family holiday first of all. 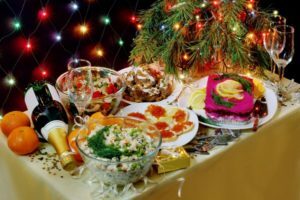 Russian cook so much food, that you’ll end up eating it for the rest of the week, and then they’ll cook just as much for Christmas, which is celebrated on 7th January in Russia. Russians cook up a storm for New Year’s Eve. The tables are abundant with different snacks, salads, pickles, fruits etc. You might find it weird, or absolutely delicious! If you’re a fan of mayo, you might fall in love with famous Russian salads such as “herring under a fur coat” or “olivier”. Hint: they’re made with lots of mayo. In general, Russians just love mayo. Pickled food is a must on a New Year’s table – pickles, pickled tomatoes, pickled fish, pickled everything. It’s usually a good snack after a shot of vodka. Caviar sandwiches and loads and loads of champagne is present at almost every table on New Year’s eve. New Year’s Eve would not be the same without mandarin oranges and their smell. They’re delicious after all, so why not?! And last, but not the least – “holodets” which is basically meat jelly. Some love it – some hate it. You’ll just have to try it and see. It goes without saying that there’s no Christmas, or in Russian case, New Year without Santa Claus. In Russia, he’s called Ded Moroz (Father Frost), and he’s always together with his helper, no not the elf, but a beautiful young lady – Snegurochka. She helps Ded Moroz to distribute the presents, and walk around the New Year’s tree signing songs with children. 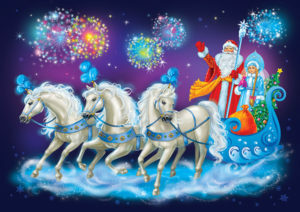 There is a sleigh with 3 white horses pulling instead of reindeers. This is an opportunity to celebrate New Year one more time. It happens on January 14th. It is the Old New Year according to an old Orthodox calendar. This is the time when we can observe all the carol singers walking from house to house signing folk songs and traditional carols. Why celebrate it? Who knows? After all, it’s a great chance to spend time with family and enjoy yet another delicious meal. Did we mention that Russians love to eat?! It’s a religious tradition to cook 12 meals representing the 12 apostles for Christmas in Russia. Typically, most of the dishes will be meatless, or just one main dish with meat or poultry. Kutya is a dish that should be present at every table. It’s basically rice (or some other grain) with poppy seeds, dried grapes and honey. It’s actually not bad at all! All other Christmas traditions are pretty much the same – early morning church service, family time and dinner together. Just like anywhere else, Easter is the day of the resurrection of Christ, and Russia celebrates this day with their own customs and traditions. Right before Easter (a day before), the churches lead services and religious processions. People come to church with traditional Easter food – painted eggs and kulichi (traditional Easter sweet bread) – to get it sanctified. After that, everyone returns home and greets their neighbors with the words “Christ is risen” (Khristos voskres!) to which they get an answer “Truly He is risen!” (Voistinu voskres!). 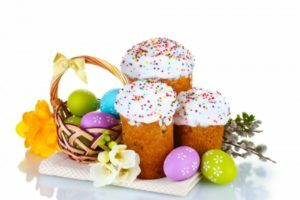 Easter in Russia is a day of a feast – all you can eat, since people were fasting for 40 days because of the Great Orthodox Lent. Now they can enjoy all the sweet kulichi. And also start exchanging and eating all the painted eggs, which is another Easter tradition in Russia. In conclusion, as you can see, Russia is not only beautiful, but is also a country of many customs and traditions. Some of these are unique, and you won’t experience them anywhere else in the world. To have first hand experience of amazing and diverse Russia contact our travel experts for bespoke travel itineraries.